I just found out about this and I am so excited. I'm a huge Gaiman fan. This is the guy who wrote Coraline, Neverwhere, and American Gods (and many other more amazing books) if you are unfamiliar with him. He's brilliant IMO, and he's always intelligent and surprising. He kept this project a secret, but now it's ready for release in late 2013. I just love the idea behind this. The setting is the 1920s, and you are a ghost who desperately wants to rid Wayward Manor, your home, of all manner of horrible and unpleasant people. It's got humor (macabre, of course), intelligence, charm and what sounds to be a brilliant story from Gaiman with some awesome visuals. From what I've read, it's a puzzle/adventure type game. Not a HOPA though. I just think the graphics look amazing... sort of Burtonesque in a way, but better! Check it out if this sort of thing interests you like it does me! Oh, I am thrilled! I went and preordered it! Only the digital download, I can't afford dinner with Neil! We have almost all his books, short stories, etc. I can't decide which is my favorite. One favorite is The Tragical Comedy or Comical Tragedy of Mr. Punch. Fabulous illustrations too, by Dave McKean. Thank you for posting this! I might never have heard about it otherwise! I know, right?? Isn't it great!! I was so excited when I found out about it that I had to share. I just knew I couldn't be the only Gaiman fan who didn't know about this. I'm so glad I was able to help you find out about it. Doesn't the game sound fun and interesting? The graphics are so cool too, and I love how he's sort of doing this independently with the developers... that way he can make it how he wants it to be. For me, the added bonus is a game with an actual STORY. I'm a huge stickler for story in a game. This one is going to set the bar pretty high, I think! The fact that if this is successful, he wants to do more is encouraging too. Oh, and it is totally difficult to pick a favorite book, but I have a fondness for The Graveyard Book and Neverwhere especially. I have only read the first Sandman though and that was because Neil himself posted a link for a free copy for Kindle on his FB page. How cool is that? I will definitely get more! Have you seen the BBC Neverwhere series? It is fabulous! It came before the book. Neil couldn't get access to some of the places he wanted for filming, so they are in the book instead. My daughter loves Anansi Boys best (Of course that should be read after American Gods), and one of the short stories, Changes. Oh, don't forget Good Omens written with Terry Pratchett! I love The Sandman series, except #2, which strays from the story of the (in my daughter's and my mind!) hunky Dream! The last one in the series is a doozy! We love how his sister is so kind to those that die. Let's put away the games and read some Gaiman instead! I am on a waiting list at the library for the newest novel. and the other is white, with Dream standing, and Death sitting beside him. 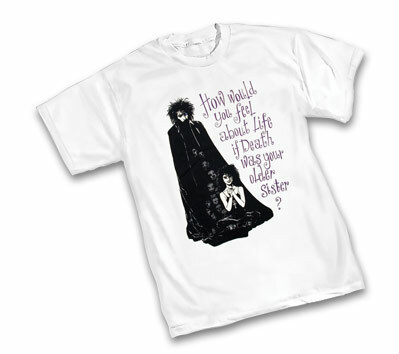 The caption reads, "How would you feel about life if Death was your older sister?" Awesome! Sadly, they're both about three sizes too big for me, but that doesn't stop me from wearing them! I've never actually read any Gaiman, save the comics. Same with Barker -- Hellraiser and Night Breed. I'm really caught up in my Harrison books at the moment, but I'll check these out once I've broken free~! Thanks so much for posting the topic, it's really exciting! I'm so glad you guys are as excited as I am. I'm planning on devouring the rest of the Sandman books now that I've read the first one. I also loved Good Omens! Thoroughly a fun read-- might even be time for a reread on that one since it's been a while. The only Clive Barker I've read was Mr. B Gone, which I liked, though I was a bit disappointed with the ending if I remember correctly. I have not seen the BBC Neverwhere, but I do want to listen to the BBC radio program of it since my beloved Benedict Cumberbatch (Sherlock in my avatar) plays the angel Islington. I'm so glad you're following along with this game too, Genki. I'm really geeked about it and I simply adore Neil Gaiman. Besides being an amazing author, he's just a cool guy. He's wise and generous with his fans. I love him to pieces! Also, for those who are interested in Neverwhere, the BBC radio version is available on youtube. Here's episode one for your enjoyment! Another huge Gaiman fan who didn't know about this game here. Definitely ordering! There's a topic for this at Steam, now~! Coming in Spring! Oh, and if you go here and click on Store, you can buy an advance copy for $10! This one certainly looks interesting! Great story idea! Heeey~! We have a release date now! Wayward Manor is due for release on July 15th! I just saw this yesterday and was going to update it... but Genki the Amazing beat me to it!